These cookies stir up memories of grandmother, a cozy kitchen and a generous glass of milk. Spray several baking sheets with vegetable oil spray and put aside. 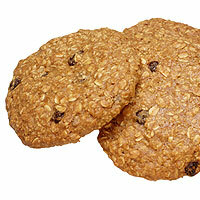 In a medium bowl, mix together oats, flour, orange peel, baking soda, baking powder, cinnamon, nutmeg and salt. Set aside. In a large mixing bowl with the mixer set on medium speed, beat together oil, brown sugar, eggs whites and vanilla until fluffy and smooth. Slowly beat in the oat mixture. Using a spoon, form cookie dough into 2 1/2-inch (6cm) rounds and space about 3 inches (8cm) apart on baking sheets. Bake for 8–10 minutes until golden brown. Remove from baking sheets and let cool on rack.